The stories and meaning behind our work is as important to us as our economic data. We maximize our impact by working with local actors to design projects that fit their needs, hiring local staff to carry out the projects, and partnering with local institutions to ensure the impact continues even after our projects end. As a result, our stories come not just from our project beneficiaries, but also from our staff and partners. Below are a select group of stories that demonstrate our impact on-the-ground. 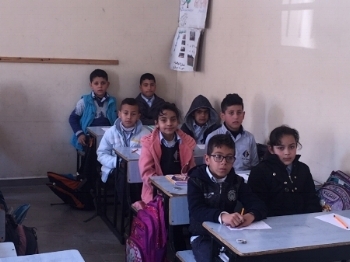 After nine years of working with various charities and non-profit organizations, Ms. Sereen al Sharif decided to establish her own foundation focused on the development of the Al-Shonah region of Jordan. Since the creation of the Jordan Valley Foundation in early 2017, Ms. al Sharif has developed 17 different programs to support area residents, including her productive kitchen project, rural economic development and employment project, and sewing workshop project. MEII provided the Jordan Valley Foundation with an accounting software program, which is part of MEII Jordan’s technical assistance program that specifically targets rural and female-led businesses. The Jordan Valley Foundation also applied for a loan of JOD 55,000 through MEII’s Tamweeli matchmaking platform to purchase the building Ms. al Sharif currently leases. و قامت بالتركيز على تنفيذ 17 نوع من المشاريع اللازمة لسكان تلك المنطقة مثل : مشروع المطبخ الانتاجي ومشروع التنمية الاقتصادية الريفية, و مشروع خياطة لسيدات المنطقة. قامت MEII بتزويد السيدة سيرين ببرنامج محاسبي من ضمن مشروع الدعم التقني للمناطق المهمشة والتي تدعم المرأة. كما تقدمت السيدة سيرين بطلب على موقع تمويلي بقيمة 55 ألف دينار لغايات شراء مبنى الجمعية. A few years ago, MEII started an internship program for financial and administrative assistance at its offices in Palestine, Tunisia, Jordan, and Washington D.C. MEII’s internship program seeks to bridge the gap between theoretical knowledge gained at universities and practical real-life work experience, with the goal of providing university students with more opportunities to find a job or start their own business in an increasingly competitive environment. Ms. Raneem joined the MEII Loan Guarantee Fund in Ramallah, Palestine during her senior year at university. During her six-month internship, she was trained by MEII portfolio specialists to evaluate business applications and financial requests. Throughout her internship, she developed an understanding of financial statements, the use of financial ratios to evaluate business capacity to expand and increase profitability, how to pay back loans from business cash flows, how to evaluate SMEs’ financial needs, how to assess the risk and creditworthiness of borrowers, and how to understand different business sectors. Ms. Raneen was immediately able to apply the knowledge she gained in her internship to real-life scenarios, adding to what she learned in the university classroom. At the end of her internship, Ms. Raneem was offered a position at FATEN, a microfinance institution, as an SME loan officer. Shireen is a young Palestinian woman who has always enjoyed painting and designing bags and clothes with traditional Palestinian embroidery. A year ago, Shireen decided to start her own business in Hebron, creating her own brand called Allar and registering the company with the chamber of commerce. Shireen began by designing bags and hiring other women working from home to do the embroidery. She then worked with a leather manufacturer to finalize the product according to her designs, as Hebron is famous for producing high-quality leather products. Recently, she expanded her product line to include cushions that combine leather, cloth, and embroidery and started manufacturing traditional clothing with a modern touch. Shireen also participated in an exhibition in Turkey where she made a lot of sales. She now also markets her products through an online shop and is planning to open a showroom in the near future. Shireen received MEII technical assistance to help her understand the pricing and proper costing of her products. MEII also provided her with an accounting software where she can register all of her financial transactions with suppliers and sales. شيرين شابة فلسطينية متحمسة ليكون لديها عملها الخاص، خصوصا انها لديها الموهبة والخبرة للرسم والتصميم باستخدام التطريز الفلسطيني التراثي. منذ عام قررت شيربن بدء مشروعها الخاص باسم حقائب علار وقامت بتسجيله لدى الجهات المختصة. شيرين ترسم وتصمم الحقيبة ومن ثم تتعاقد مع احدى السيدات لعمل التطريز من ثم تعطيه لاحد مصانع الجلد لحياكة الحقيبة حيث ان الخليل تشتهر بالصناعات الجلدية. في الآونة الأخيرة وسعت شيرين منتجاتها لتشمل الوسادات المصنوعة من الجلد والقماش المزينة بالتطريز الفلسطيني اضافة للملابس التراثية المصممة بلمسة عصرية. شاركت شيرين بمعرض في تركيا حيث حققت مبيعات عالية اضافة لتسويق منتجاتها عبر الانترنت وتخطط لفتح معرضها الخاص قريبا في الخليل. مبادرة الشرق الأوسط ساعدت شيرين في حساب التكلفة لمنتجاتها ومن ثم تسعيرها، حيث ساعدها البرنامج المحاسبي بضبط معاملاتها المالية مع الموردين و المبيعات.
" مبادرة الشرق الاوسط للاستثمار ساعدتني لاحتساب التكاليف الحقيقية المرتبطة بالمنتج النهائي وأيضا مراقبة نمو المبيعات و الأرباح على مر الأشهر الماضية"
Mrs. Tamam has over 30 years of experience in sewing and dressmaking. She used to have a workshop in her family house in the refugee camp near Ramallah, however, she was forced to move to a new location, losing her business in the process. After lengthy period of searching for a new workshop, she finally found one, but unfortunately she needs finance to start her business from scratch. This included purchases of sewing machines and workshop building maintenance. Mrs. Tamam faced difficulty in getting the financing due to her age and collateral requirements. Tamweeli was the solution. Mrs. Tamam now has a workshop with around 20 machines. Two employees working with her and intends on expanding her workshop to hire 4 more, not only Tamweeli helped Mrs. Tamam to maintain the only source of income for her family but also created six more jobs. السيدة تمام لديها أكثر من ثلاثين عاما خبرة في الخياطة وتفصيل الملابس، كانت تدير مشغلها في منزل العائلة في المخيم بالقرب من رام الله، لكن للاسف اضطرت لترك المكان لتبدأ رحلة شاقة في البحث عن مكان جديد، لكن عندما وجدت المكان لم تنتهي متاعبها فالحصول على تمويل لتجهيز المكان وشراء بعض ماكينات الخياطة لم يكن بهذه السهولة بسبب عمرها المتقدم ومتطلبات الضمان. موقع تمويلي الموقع الاول في فلسطين للربط بين الممولين والباحثين عن تمويل وجدت لديه الحل.
" لقد بدأت افقد الأمل في الحصول على تمويل لمشروعي بسبب رفض بعض المؤسسات طلبي، لكن موقع تمويلي انقذني وحصلت على التمويل للبدء بمشروعي من جديد، شكرا لموقع تمويلي ولموظفيه الرائعين"
السيدة تمام لديها اليوم قرابة العشرين ماكنة وتعمل لديها سيدتين وقريبا جدا ستوظف اربع سيدات اخريات، موقع تمويلي ساعد السيدة تمام باستمرار مشروعها مصدر الدخل الوحيد للعائلة و ايضا ساهم في خلق ستة فرص عمل لسيدات. However, the brothers quickly realized that they were losing control over their stock and their expenses. They needed to find a more efficient way to manage their financials. Fortunately, MEII introduced them to technical assistance program . With the right training and financial software, they were able to properly manage their business and make advancements to produce further growth. أربعة اخوة بتخصصات مختلفة يعملون كموظفين، قرروا ان يبدأوا نشاط تجاري خاص لأن الوظيفة دخلها محدود و لا تغطي تكاليف الحياة التي تزداد بشكل كبير في ظل محدودية راتب الوظيفة، قرر الاخوة افتتاح محل للألبسة الرجالية في مدينة بيت لحم حيث قاموا بتعيين موظف للفترة الصباحية ويتناوب الاخوة علي الفترة المسائية. المحل حقق مبيعات جيدة وساعد بتحقيق دخل اضافي للاخوة مما ساعدهم في توفير دخل اضافي لعائلاتهم، لكن بعد فترة اتضح لهم انهم لا يستطيعون ضبط المخزون من حيث الأصناف او الكميات اضافة للربح الصافي المتحقق. لحسن الحظ ساعدتهم مبادرة الشرق الأوسط ومن خلال برنامج الدعم الفني بتقديم النصح والارشاد حول الادارة المالية اضافة لتزويدهم ببرنامج محاسبي مكنهم من فهم وضعهم المالي وامكانيات التوسع. "شكرا لمبادرة الشرق الأوسط للاستثمار، اليوم نستطيع معرفة كميات المخزون والأصناف الأكثر رواجا ومبيعا لدينا وبالتالي شراء الموديلات المناسبة. نستطيع تسعيرالبضاعة بطريقة أفضل والحصول على جميع التقارير الضرورية كما اننا تمكنا من معرفة الربح الحقيقي بعد ادخال جميع المصروفات مثل الرواتب والكهرباء والايجار." Samer Barakat joined MEII in 2007 as an office assistant, mainly working to assist the HR manager and driving staff to field visits. His admirable work ethic allowed him to advance to a position as the office assistant and security coordinator in 2009, taking on the additional responsibility of managing office security. In 2014, Samer was once again promoted to the position of administrative officer, responsible for all human resources issues including managing employee files, staff attendance, time sheets, and procurements. This new position also entailed acting as a receptionist and planning field visits. Samer holds a diploma in Networking and Telecommunications from the Palestine Polytechnic Institute in Hebron. 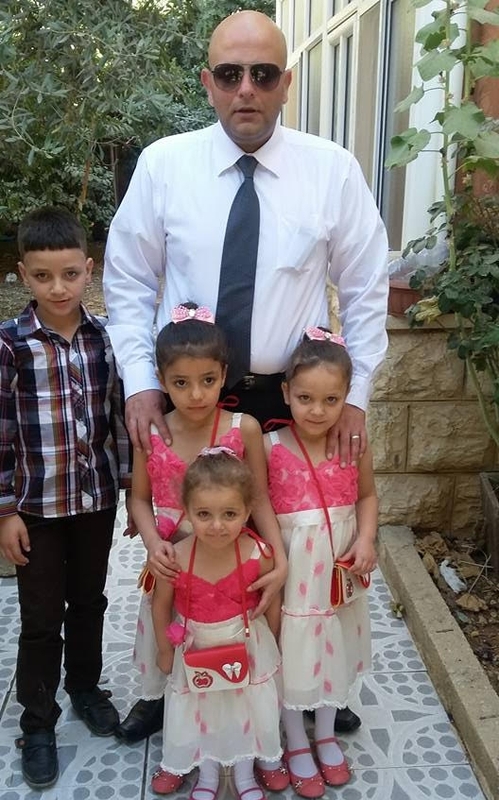 He lives with his wife and four children: Mohammad (10), Naheda (8), Nisma (7), and Naleeen (5). 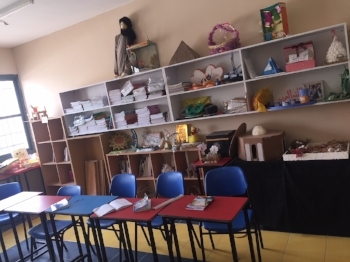 MEII’s provided an entrepreneurial Palestinian woman with a loan guarantee and technical assistance, allowing her to ambitiously expand a private school of her own. The woman’s personal experience, in which she was unable to finish her own education until after 10 years of marriage and raising three children, coupled with her desire to provide high quality, affordable education in her West Bank village, led her to open her own school in September 2012. In 2014, MEII initially guaranteed her loan of $200,000 from a Palestinian bank and later agreed to increase the size of the loan to $323,000. MEII also provided technical assistance, increasing her financial management skills and business confidence. With MEII’s help, the woman was able to expand her land ownership from 500 to 5000 square meters to build a new and improved school, which opened in 2015. Her school has 300 students, 18 female staff members (out of 23 total), and five administrators. Her school teaches advanced curriculum in English and extracurricular activities. She is also planning on opening a summer camp beginning in the summer of 2018. The woman’s school provides children with the opportunities she didn’t enjoy when she was young, delivering affordable, accessible, and high-quality education to her village. Congratulations and thank you for helping further access to education in the West Bank! بالرغم من انها لم تكمل دراستها الثانوية بسبب عدم وجود مدرسة ثانوية في قريتها، الا ان ذلك لم يثنيها عن السعي لتحقيق حلمها بعمل مدرسة خاصة تقدم تعليم مميز بجودة عالية مبنية على تطوير وبناء الشخصية والمهارات الحياتية اضافة للانشطة اللامنهجية. فبعد عشر سنوات زواج وانجاب ثلاثة اطفال اصرت هذه السيدة الفلسطينية على انهاء الثانوية العامة ومن ثم الحصول على درجة البكالوريوس في اساليب تعليم اللغة الانجليزية. بدأ حلم انشاء مدرسة خاصة يراودها مع دخول ابنائها المدرسة حيث لم يكن التحصيل الاكاديمي بالمستوى الذي تتمناه. فبدأت باستئجار مبنى وتجهيزه لتتمكن خلال تسعة اشهر من افتتاح مدرستها و استقبال 170 طالب في العام 2012. لكن هذا فقط كان البداية لبناء مدرستها وفق اعلى المواصفات، حيث تمكنت تدريجيا من شراء ارض بمساحة 5000 متر مربع. في العام 2013 بدأت ببناء المدرسة عن طريق الحصول على تمويل بقيمة 200,000$ من احد البنوك الفلسطينية لترفعه لاحقا الى 323,000$ هذا التمويل لم يكن ممكنا لولا برنامج ضمان القروض لدى مبادرة الشرق الأوسط للاستثمار والتي قدمت لها ايضا الدعم الفني والتقني في الادارة المالية والمحاسبة من خلال برنامج تمويلي. في عام 2015 حققت حلمها بافتتاح المبنى الجديد للمدرسة باحدث المواصفات والمختبرات كما توفر تعليم اكاديمي وانشطة علمية وترفيهية ورياضية مميزة للطلاب في القرية، تضم مدرستها اليوم 300 طالب وفيها 23 موظف. الاحلام لم ولن تتوقف ففي جعبتها المزيد. *Due to moral hazard reasons, we have used pseudonyms in place of the entrepreneurs' actual names. Tala, a young female entrepreneur with a bachelor’s degree in optics and vision science, worked in a health center as an optician after completing her studies. Following that experience she partnered with a friend, Yasmin, to open an optical and vision center in their city. This Kindergarten was founded 10 years ago by a dedicated and passionate educator who successfully built a wonderful reputation among parents, but who struggled with her financial performance. MEII provided technical assistance and developed her booking and accounting system so that this ambitious entrepreneur could focus more on educating her 600 children instead of struggling with her back of the envelop financial system. Photographs and description provided by Fawz Abuhijleh, MEII Palestine Staff. Mohammed and his two brothers own and work in a strawberry farm green house in a village near Tulkarem in the northern West Bank. They invested in a new method of planting strawberries in hanging pots, instead of soil, which dramatically increases production yield. However, without an accounting system, they struggled with their finances and financial performance. Suzanne, a pharmacist living in a village near Ramallah, is an ambitious and active entrepreneur. She is not only the founder and owner of two local pharmacies, but has become a beloved public figure within her local community and a role model for all the young girls in her village. MEII helped her learn the skills she needed to record, track, and understand her financial transactions and develop new financial statements. The accounting software also allowed her to track stock quantity and manage the expiration of pharmaceutical products in her business.